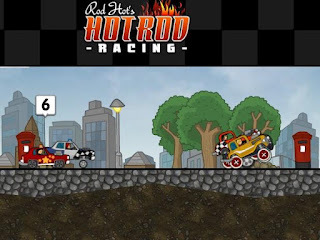 Rod Hots Hot Rod Racing is a new side scroller car simulation game from turbonuke. Your name is Rod Hot and with a name like that, you are too embarrassed to do anything else but hot rod racing. With that being said, your objective is to become the Hot Rod champion of the world and to just that you have to go over 24 levels while you unlock and ride 12 different cars. You start off with your cheap tornado car but as you win races you will earn money which you can then use to purchase upgrades for your car or buy a more powerful and brand new one. I have played many side scrolling car racing games before but what makes this one hold its own is the car suspension set up alterations where you can tweak your car's tires, springs and ride height in order to cope up with terrain that you are going to race in. At first you may find it a bit too easy to flip over but some little experiments on your car's ride height and wheel size and you will get the knack of it. One tip I can give is that if you are racing in rough terrain, set your ride height low to lessen the bounce. Meanwhile, here is Rod Hots Hot Rod walkthrough with the gameplay.